My super friend Laura just stopped by my house a few hours ago bearing two containers of homemade non-dairy ice cream. The kids and I didn't waste any time digging in -- as you can see from the photo above of JD! 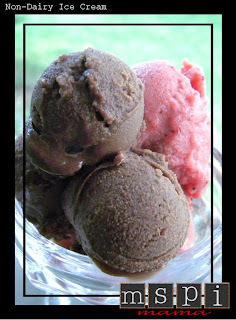 The chocolate ice cream was surprisingly creamy for a non-dairy version, and the strawberry ice cream reminded me of a sorbet -- so cool and refreshing! Laura also sent me her recipes, which were adapted from Elana's Pantry. I immediately put my ice cream maker's canister in the freezer. I'm going to be making my own batches of this yummy stuff all summer long! Do you have an ice cream maker? If you don't, then these recipes will make you want to go get one. Pronto! Mix dry ingredients together in bowl. Add milk and vanilla, stirring together until sugar dissolves. Combine wet and dry ingredients. Freeze the mixture in an ice cream maker according to the manufacturer’s directions. Place all ingredients together in a blender or processor. Blend to desired smoothness. Tip: To make the ice cream even richer and creamier, substitute coconut milk for the rice milk. 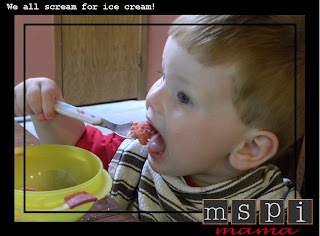 Make other flavors of ice cream by substituting your favorite fruit for the strawberries. Wouldn't mango be fabulous?! Have you tried coconut milk ice cream? It is almost like the real thing and so easy you do not even need a recipe. Just a can of coconut milk with rice milk (fill the coconut can up) mix in some sugar and vanilla and freeze. It is very creamy and wonderful!! This is my third baby with MSPI and I am also gluten intolerent. The gluten bit is throwing me for a loop this time around. I appreciate your site. Some of the recipes give me ideas of what I can alter to make gf as well. Take care.